The local Salt Lake Comic Con comes twice a year. The first is really just a small convention as a kind of teaser or a fun time for those in need of some winter relief. The winter/spring event is called Salt Lake Comic Con FanX and this time the FanX is expecting half the attendance of the previous year’s main convention which drew in over 100,000 visitors. That means there isn’t as much news but there were a few indie films with premiers, some zombie laser tag events, and of course the obligatory cosplay. What I find amazing about the cosplayers in the usually conservative state of Utah is that they’ll throw themselves fully into their characters. The day one Cosplay was a blast to capture for everyone outside of the state no one thought could draw crowds as big as has and continues to. The event is family friendly with two kids under the age of 10 free with each adult pass. That means there is some wonderful family friendly cosplay and some eye-catching, head turning, jaw dropping cosplay as well. Consider Day 1 a tease for the content yet to come. Some personal favorites of mine were Cosplayer Vegas PG, Heavy Metal Thor, Kevin Smith and Jason Mewes at the Deathray Comics booth, and comedian Jay Whittaker dressed up as Deadpool. If you’re at the Salt Lake Comic Con FanX 2015 event, look for me with a burly beard, a samurai pony tail, and an obligatory “adult” beverage in hand as I wonder the halls of the Salt Palace. For everyone else, hit me up on Twitter @MarkAvo. Mark Avo can usually be found behind a keyboard coding for databases or reviewing comic books. He can also be found writing and inking The Salt City Strangers comic book or pretending he’s an expert on their Indie Publishing podcast The Undead Soup. You can delight or even heckle him with your tweets @MarkAvo and he’ll be totally thrilled. The photographer, Brandigirlio, can be found on Twitter @Brandigirlio and making sure I remove bits of food from my beard. A Supergirl Villain Revealed – But Will Superman Appear? 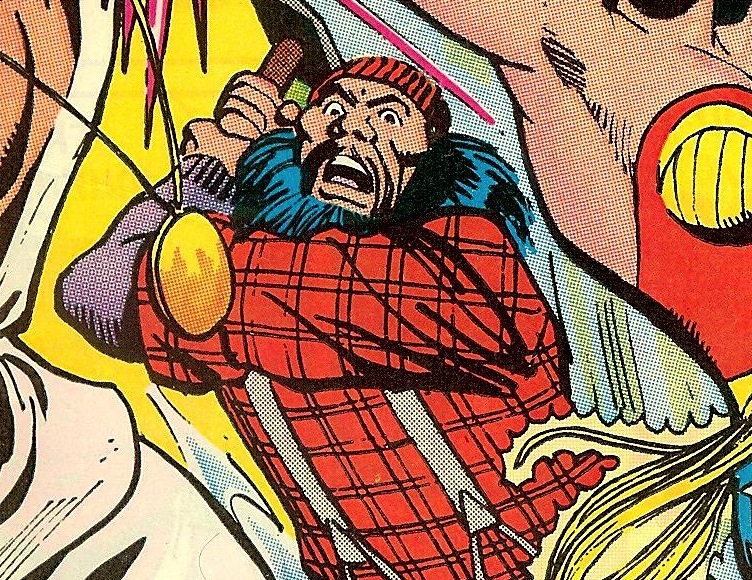 The Lumberjack will face off against Supergirl in the pilot episode of CBS' upcoming TV series. According to TVLine, the DC Comics-based series is seeking a towering actor -- someone akin to 6'6" Games of Thrones star Rory McCann -- to fill the role of Lumberjack in the series' first episode. It is also indicated that this version of Lumberjack, who is characterized as a "big, burly monster of a man," would have already faced Superman in the show's established history, begging the question of whether we'll eventually see Superman himself appear on the series down the line. “Yes Gorillaz Returns” – Jamie Hewlett. It made him the richest cartoonist on the planet. For more on Legenderry: Vampirella #1, which comes out this week, click here. Portal 2, for me, is one of the finest video games of the last 10 years. It blends razor sharp wits, genius puzzling and a legendary environment into one silky package. I really can’t get enough of that world. I think we are quite some way away from Portal 3, mind you. That’s if it ever comes and that’s by no means certain. In fact, I’d guess it’s less likely to happen than happen. The game will continue to be supported by a modding community for a long time though. Of that I have no doubt. On that note, it looks like we might have a pretty interesting looking mod just on the horizon. Portal Stories: Mel is currently being worked on by Prism Studios and is due out in Q1 of 2015. Here is a trailer for the mod. Thanks to Destructoid for the heads up. On the mod’s steam profile, they give the lowdown on the story and what to expect from the game. Yes. Yes to all of that. I’m going to keep a watchful eye for this. This is how Superman currently looks in the New 52. We were told that Superman #38 will bring us a “new costume, new powers and new friends and enemies.” Though that cover is a little unclear. Well, the cover to Superman #39 gives away the farm. A farm designed by John Romita Jr.
Look, he’s got built in fingerless gloves. A few less creases, a cutaway point on his boots and a rounder and yellow belt sigil. No red underwear still though. After three episodes filled with backstory and revelations about the rising darkness, Zed (Angélica Celaya) and Chas (Charles Halford), this week’s Constantine was more of a monster of the week episode. Four college students are in a crypt, drinking and playing around with some kind of spellbook. Suddenly things get serious, as suddenly each student is alone in a different room of a house. The first, Charlie, finds himself in a dungeon, with a table dripping blood. Another, Adam, in a kitchen with a priceless vase. Miranda appears in a bedroom, picks up a book with blank pages, and suddenly a man (William Mapother) can be standing behind her can be seen through the mirror.. The fourth student, Lily, is in a living room. The furniture is covered with sheets. A man grasps her from behind, telling her “He can see you. You have to hide me.” Miranda sees the man in the mirror and screams, Adam drops the vase, and suddenly they are back together in the crypt. John Constantine (Matt Ryan) is relaxing in the cabin, drinking his troubles away, when Manny (Harold Perrineau) appears. Manny berates John for being lazy and tells him to check the skry map. A friend nearby needs help. Lily is in class, and it’s being taught by none other than Ritchie Simpson (Jeremy Davies), last seen in the pilot episode. Ritchie dismisses the class, when John, posing as a student, tells holds everyone up because he has a question. I guess we found John’s friend. Charlie is walking along campus when he sees a reflection in a window. It is the man from the bedroom, and suddenly the boy is in the house, with a plastic bag over his head, suffocating. Back on campus he is lying on the ground, not breathing. Ritchie is not happy to see John. When they last saw each other, they made a deal; Ritchie helps with the demon in Atlanta, and John stays away. Ritchie tells John that he is out of the game, he is no longer data mining. He teaches class and he goes home. They are interrupted by Adam, who is Ritchie’s assistant, saying that he can’t come in because his friend died. As Adam is talking, his girlfriend, Lily, sees the man in the mirror and screams. The students hold a vigil for Charlie, and John and Ritchie go to talk to Adam. They don’t see him, but Miranda is there, talking with Lily. She tells Lily about the man she saw in the mirror, only Miranda denies seeing anything while they were at the crypt. Lily claims that they imagined seeing something at the crypt, she learned all about it in her psychiatry class. There are few things more annoying than students in an entry-level psychology class that suddenly think they can diagnose everyone around them. As Miranda leaves, John and Ritchie walk up. Lily tells them about the cemetery, but not the vision. John knows she is hiding something, and thinks Ritchie is as well. he was a true believer before Newcastle. Manny asks whether John could recruit Ritchie to help fight the rising darkness. In the crypt, Manny disappears as John finds residue from the spell the night before. John does his own spell, and symbols appear on the ground. Miranda begins warming up for dance practice in a very dark studio. I have no idea why she is practicing alone, at night, in the dark. I mean, I could buy the first two. She’s getting some extra practice in whenever she can. But why not turn on a light? It’s a silly way to try to make the scene extra creepy. Anyway, the man from the house once again appears in the mirrors and Miranda gasps. They make eye contact, and suddenly she is back in the house. There is a man there, and he tells Miranda she needs to open the door, quick, before the other man comes back. She asks why he doesn’t just open the door, and he shows her his hands. Or at least the stumps where his hands would be. John goes to talk to Ritchie. The symbols at the crypt were Egyptian hieroglyphics. Ritchie realizes that Adam got the book from his office. The book was the journal of Jacob Shaw, a mystic who believed he could travel to other dimensions and shot his partner. While Shaw was awaiting trial for murder, his slipped into a catatonic state, possibly sending his consciousness to another realm. And I think we know who the man in the mirror is. John tells Ritchie that Adam is likely to try again, and that they need to beat him to it. Hey, what do you know, John was right. Lily is worried about Miranda, and Adam tells her that they should look for her at that house. Yeah, good idea. Lily refuses and heads to the dance studio. John warns Ritchie that, due to the rising darkness, anyone could be pulled through the gates that students opened, not just the Adam and his friends. They continue to look for Adam, obviously they haven’t bothered with his girlfriend’s apartment seeing as how he was just there. Of course Adam goes back to the crypt and travels to the house. He finds Miranda, only she’s been stabbed through the stomach. She says that they need to get out, he’ll be back. They hear footsteps, as Lily finds dead Miranda’s body at the gym. John and Ritchie find Adam at the crypt, at least his body. His spirit is somewhere else. At the house, Adam sees the man in the mirror, and recognizes him as Jacob Shaw. Shocking, I know. Anyway, Shaw cuts Adam as John and Ritchie see the wounds appear on Adam’s body back at the crypt. Ritchie feels guilty that three people are dead because of a ritual that they found in his office. John tells him to knock it off, that he didn’t tell them to do the ritual. Ritchie tells John that he can see through the bull, he knows that John is only pretending not to feel. Ritchie and John go to see Lily. They tell her that Adam is dead, she tells him about the house. Speaking of, Adam, he Miranda and Charlie are all still at the house even though their physical bodies have died. Shaw enters, and tells them that he wants to play. He is going to choose a weapon and hunt them. Miranda and Charlie run, Adam stays put. He knows that Shaw controls the place, that he built it. He thinks Shaw can’t really hurt him there. A sledgehammer to the knee changes his mind. John brings Ritchie and Lily back to the mill-house. John tells her that there was a protective spell put on all reflective surfaces in the mill-house, so being the brilliant damsel in distress, Lily takes out her cellphone and sees her own reflection followed by Shaw’s. Hey, guess who’s now at the house with the rest of her friends. She opens the front door to try and escape but the house is in the middle of nowhere. Literally. Not like a field somewhere, but actually nowhere. She goes back in, locks herself in a room and finds Adam. He tells her that Shaw is a lunatic, he keeps killing them and bringing them back to life. She needs to get out. John tells Ritchie he can’t get her without him. Ritchie is worried about their bodies, but Manny appears and John knows the angel will watch over the bodies. They do the ritual, and show up in the house. They are in different rooms of course, and Ritchie hears a teakettle whistling and grabs a candlestick to use as a weapon. He enters the kitchen and turns off the stove, why I don’t know. Wouldn’t that tell Shaw exactly where he is? Ritchie hears a noise, and turns, but it’s John. They hear footsteps and look for Shaw. They find a dead end, but Ritchie thinks he can overwrite Shaw’s control. He does, and a door appears in front of them. They end up in the room with the covered furniture, and Ritchie notices that some of the furniture is moving. They find the handless man, only now he has hands and it’s really Jacob Shaw. One waive of the hand and Shaw slits Ritchie’s wrists, another waive and John is nailed to the wall. John tells Ritchie to focus, that he can beat Shaw. John says that he believes in him and Ritchie creates a sun and a world around the house before he utterly destroys Shaw. He says they have to get out, which they do, by going through the front door into the now-existent field. Suddenly John remembers Lily; she is with her friends inside the house. She runs out the door only they cannot follow and the house implodes with them inside. John tells her that Shaw is gone, and their souls are free. Lily wakes up, crying, while John and Ritchie stay behind. Ritchie wants to stay behind to create a world. He has an opportunity to create something new, and he doesn’t want to return to reality. Basically, he wants to play minecraft for all of eternity. John has no interest in losing another friend and he begs Ritchie to return with him. John tells Ritchie that he isn’t staying behind to create, he is running away before he wakes up. He tries to wake up Ritchie only it doesn’t seem to work. John is about to give up when Ritchie wakes up. A pretty solid episode with some genuinely creepy tones. I am really enjoying the way that the show can switch back and forth between straight horror, sci-fi action and suspense. It’s pretty easy to create an eerie scene at a graveyard at night, but the house was something unique and it worked. At first I thought the episode was going to be a simple Saw knock-off, but it wasn’t. Shaw was a hunter, who didn’t care who came into his world, all he wanted to do was hunt them again and again until the end of time. The idea itself is seriously frightening; there is no escape. All that they will do is die again and again until time itself ends. They will have nothing but fear and pain for eternity. And the casting was perfect. William Mapother can just look like a freak when he wants, like when he played Ethan in Lost. If there was one downside to the episode, it was the ending. Shaw had been in this world for years, creating it from his own imagination, after years of studying the principals of transporting to a different dimension. Ritchie, on the other hand, had read Shaw’s diary. That’s it. He had never actually been to another place. Yet, on his first trip, he is able to overpower Shaw in his own world. He is somehow stronger. Why, we have no idea. Somehow, Ritchie overpowers Shaw and recreates the world as he sees fit. The least they could have done would have been to give some reasoning. Like, for instance, some bull about the spirit losing touch with reality and getting weaker the longer it is away. Anything. There is just no real reason that Ritchie should have been able to overpower Shaw, especially as easily as he did. Shaw found them, attacked them, John gave a pep talk and within a minute or two Ritchie destroyed Shaw. I also would have liked to see Zed and Chas. After last week, it would have been nice to see Chas again, and how he interacts with John. At least him being with his family would make sense. As for Zed, John tells Manny that she is on bed rest, but then when they return to the millhouse later, she is nowhere to be found. It looks like in the next episode she is suffering from a mysterious illness, so maybe that will explain it, but her absence was rather conspicuous in this episode. This was also the second straight episode in which we get nothing to further the main plot of the rising darkness after the big midseason cliffhanger where we learned about the Brujeria. Unfortunately, with just two episodes left, it seems as though the major overarching storyline will never get resolved. Unless of course someone else picks up the show. Hulu? Amazon? Yahoo? Anyone? Please? Rich Epstein writes for Bleeding Cool. He can be found on twitter at @kaspe_r11. Hitting shops this week from Valiant is the new series Imperium #1 by Joshua Dysart and Doug Braithwaite along with X-O Manowar #33 by Robert Venditti and Rafa Sandoval. A daring new superhero saga from New York Times best-selling creator Joshua Dysart – writer of of the Harvey-Award nominated series HARBINGER – and superstar artist Doug Braithwaite (UNITY, Justice)! Toyo Harada is the most dangerous human being on the planet. Imbued with incredible powers of the mind, he has spent his life guiding humanity from the shadows. But today he is a wanted man. His powers are public knowledge, his allies have turned to enemies, and he is hunted by every government on the planet. Instead of surrendering, Harada has one last unthinkable gambit to play: to achieve more, faster, and with less, he will build a coalition of the powerful, the unscrupulous and the insane. No longer content to demand a better future, he will recruit a violent legion from the darkest corners of the Earth to fight for it. The battle for utopia begins now. X-O Manowar has beaten the Vine. Survived the Armor Hunters. Come face to face with the Armorines. Now he faces an unimaginable threat…a threat from beyond the grave. The lesson needed to defeat them resides with his past and the greatest love of his life, Deidre of Dacia. But the last Aric knew of her, she was captured by the Roman legions and heading towards a slave camp. Her story, however, did not end there. Heavy hangs the head the that wears the crown. Join New York Times best-selling writer Robert Venditti (Green Lantern, The Flash) and rising star Rafa Sandoval (X-Men: Legacy) for this special done-in-one jumping-on point issue – revisiting a mystery ripped from the pages of X-O Manowar #1! While I never played it to completion, the blistering pace of Metal Gear Rising always struck me. It was nothing like the slower paced main series that featured Snake, instead focusing on superfast hack and slash action perpetrated by Raiden. By all accounts it was a great little distraction for the series. If you were a fan, you could be in luck as a sequel may have been teased at the Taipei Game Show. During a sizzle reel for PlayStation titles, a mysterious ‘2’ flashed onto the screen (Kudos goes to NeoGAF for catching the anomaly). While it had no context, the number was distinctly in Metal Gear Rising‘s typography. They certainly look cut from the same cloth. While this could feasibly be anything, but I’m putting my money on this being another in the series. That style is pretty distinct and a sequel to the game feels natural. So I’ve been on an Anthony Bourdain kick lately, thanks to ABC’s show The Taste where he is a judge. (If you haven’t seen it, watch it. It’s like The Voice, but with food.) Anyway, coincidentally I was going through a pile of graphic novels that I’d been neglecting the other day and came across a memorable cover with, “New York Times Best Selling Author, Anthony Bourdain” displayed at the top. I know it’s been awhile since the release, but after reading the story I had to write about it. From, Vertigo, Get Jiro!, written by Anthony Bourdain and Joel Rose, with art by Langdon Foss left my stomach growling and my head satisfied from reading such a distinctive plot. We begin in a futuristic version of LA, that is entirely dominated by food culture. Two chef warlords rule the city: Bob, a supporter of finer imported things, and Rose who supports all things locally grown. The story focuses on Jiro, a headstrong Japanese chef with a very particular style, especially when it comes to rice. His business becomes affected by the way things are going in the city, and he decides to take matters into his own hands to bring peace to the people. I have to say that I’ve read a lot of books dealing with futures much different than the present day we all live in, but I’ve never encountered something quite like this. Food is obviously the star of the tale, and I can assure you that at some point while reading you will say, “I have no idea what that is, but it sounds and looks delicious.” I assume that’s where Anthony Bourdain really came in handy when working on the comic. The people that live in this city are completely obsessed with food. It’s very interesting to watch a multitude of characters fight for reservations at a restaurant. At one point, a woman exclaims that if she isn’t allowed into a certain place to eat she will kill herself. Jiro is a unique main character, that clearly has a complicated past. We don’t really get to hear much about his background, but his behaviors and actions say it all. He’s one tough guy, that isn’t afraid to step out of his comfort zone—especially when it involves food. The plot is pretty intense and fast paced. You can count on a lot of action packed, surprising scenes. Once you start reading, you won’t be able to put it down. Unless of course you become so hungry that you take a break to grab a snack. Although I will warn you, Langdon Foss can illustrate some nice dishes, but he can also create some stomach turning graphic scenes. There is a decent amount of gore throughout. The ending left me a little deflated as far as the warlords go because I really wasn’t a fan of Bob or Rose’s characters. However, I did love the taco guy! I guess the main point is how Jiro’s story ends, and I won’t spoil that here. Overall, I would recommend Get Jiro! to foodies. If you have an appreciation for food and how competitive these communities can get, you will enjoy the story.